The Standard and Extended Air Experience flights and the 3 flight and 10 flight introductory packages can be purchased via a gift voucher. The voucher is delivered with a map and an introductory letter. You can pay online or call Mick Webster on 0418 269 145	if you'd prefer to speak to a real person. You can also email us. Alternatively, you can purchase any of the flights or packages at the airfield when you visit to enjoy your flight but in that case only cash is accepted. 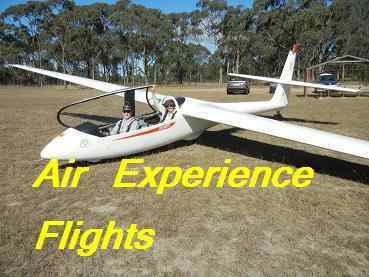 The gliders are certified for a maximum passenger weight of 110kg. This cannot be exceeded, even by 1kg. There is also a minimum weight but we have extra ballast weights to make up the difference as long as the person weighs at least 55kg. If the person weighs less than 55kg he or she will be required to sit in the back seat. Other than weight, if the person can fit comfortably into the glider he or she can fly in it. If you choose online or email delivery, you will receive a PDF file containing the voucher. You need to be able to print this on your own printer. We don't have internet access at the airfield so we can't look up your name online. Choose one of the postal delivery options if you're not sure. Your name will appear on the voucher as "From"
3 flights (by one person) on the same day, depending on conditions. You will start learning to fly. 10 flights (by one person) within a 3 month period. Includes 3 months membership of the GFA and the club and a log book. Not enough to go solo without prior experience but you should be well on the way! Please allow 2 working days for your deposit to clear. Deposit instructions will appear on the next page. Please allow 2 working days for your cheque to clear. Instructions to post the cheque will appear on the next page. For online and email delivery methods you will have to print the voucher on your printer, preferably using a colour printer on heavy paper 120gsm or greater. We will contact you for details when payment has been received. You cannot select online delivery without online payment! Please allow 14 days for postal delivery. Vouchers are posted in a presentation envelope inside a plain envelope.